VANCOUVER, Jan. 14, 2019 /CNW/ - Rover Metals Corp. (TSXV: ROVR)(OTC Pink Sheets: ROVMF) ("Rover Metals" or the "Company") is pleased to announce that the Company's technical team has identified its drill targets for the Cabin Lake Gold Project (the "Property") based on a combination of (i) its interpretation of historic workings and (ii) the recently completed geophysical and geochemical program performed in Q3 and Q4 of 2018. Judson Culter, CEO at Rover Metals, states: "The 2018 magnetic survey and soil sampling program results have expanded the anomalous zones and expanded on the known gold mineralized zones. Within these zones we have identified the best drill targets for converting the historic drill results into current NI 43-101 resource standards. The new targets were developed from the re-interpretation of the historic work programs completed to date, which included over 7,500 meters of diamond drill data purchased from North Arrow Minerals – a legacy asset from exploration drilling completed by Aber Resources (Grenville Thomas) in the late 1980's." The Company has found and GPS referenced all the historic blasted trenches and small pits at the Andrew North and South Zones, as well as those located at the Beaver, Camp and other locations within the Property. 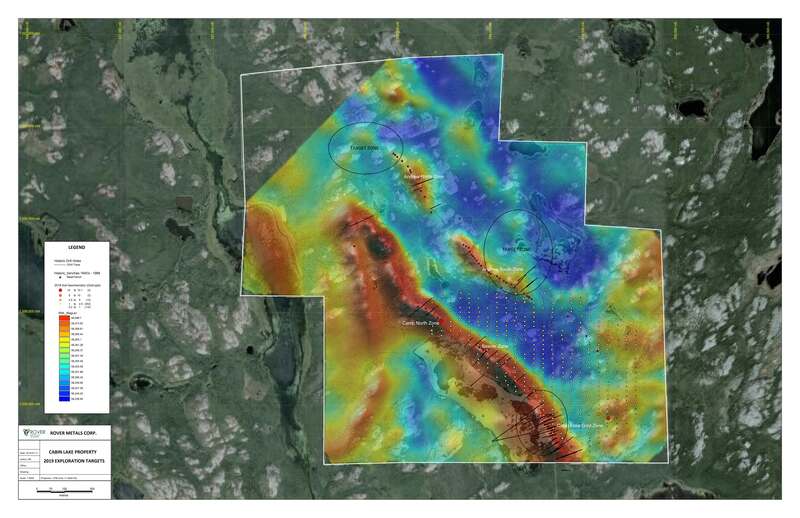 The UAS magnetic survey was key to providing the desired resolution and contrast on the Bugow Iron Formation, known host of the Property's gold mineralization. The 2018 ground geochemical soil survey produced multi-element (Au-Ag-As-S-Cu) anomalies over known mineralization zones and additional zones coincident with conceptual mineralized targets. Three zone were prioritized for the 2019 diamond core drilling campaign: Click Here. This mineralized zone is the anchor mineralized zone for the Property. It has a historic non-NI 43-101 compliant resource estimate of 100,000 tons grading 10 gpt Au. Mineralized zone strike length is over 100m and to a shallow depth of 70m from surface. The best historic mineralized diamond core drill holes reported by Aber Resources include 15.0g/t Au over 12.1m (in hole DDH86-28); 15.8 g/t Au over 8.02m and 9.6 g/t Au over 1.04m (in hole DDH86-12); and 12.5 g/t Au over 4.1m (in hole DDH86-26), amongst other encouraging drill intercepts. Rover Metals will continue to diamond core drill this zone at different hole geometries, with a larger area diamond drill core diameter (NQ2 or HQ) in order to both validate the historical intercepts and continue to expand the mineralized zone along strike and depth. This mineralized zone has been expanded from the re-interpretation of the historical data. The Bugow Iron formation surface projections from the UAS magnetic survey clearly indicates the historic mineralized zone geometry is comprised of 100m long tight fold closure (hinge) of a synform that wraps along the Bugow Iron Formation and continues to the northwest. The topography is also recessive on that flank of the synform and the intensity of the Total Magnetic response may indicate sulphidization, in a very similar arrangement as the Cabin Lake Gold Zone. More than 20 historic pits/trenches have been identified by GPS surveying. The Andrew South zone has a non-NI 43-101 compliant resource estimated at 43,900 tons grading 4.39 gpt Au. A diamond core drill program has been designed follow the hinge down dip under the historic open cut towards the northwest following the fold limb in areas or reduced magnetic intensity that suggest higher sulphide content as replacements of the Iron Formation as part of the proven geologic model. This mineralized zone has been reinterpreted from historical data. The fold closure (hinge) geometry correspond to an antiform and it is more open than at the Andrew South. All trenches/pits have been GPS located. The Andrew North zone has a non-NI 43-101 compliant resource estimate of 18,100 tons grading 7.89 gpt Au. A diamond core drilling program has been designed to further investigate areas of reduced magnetic intensity within the Bugow Iron formation at the hinge zone coincident with recessive topography, to test for gold mineralization. Additional shear zones and parallel sets of sulphidized iron formations have been located in other parts of the Property and a meaningful exploration program has been designed to perform prospecting, mapping, and sampling. Technical information in this news release has been approved by Raul Sanabria, M.Sc., P.Geo., VP of Exploration at Rover Metals Corp. and a Qualified Person for the purposes of National Instrument 43-101. Rover Metals is a natural resource exploration company specialized in Canadian precious metal resources that is currently focused on the Northwest Territories of Canada, one of the most mining friendly jurisdictions in North America. Rover Metals will have a booth (#911) at the upcoming Vancouver Resource Investor Conference on January 20-21, 2019 featuring a 3D rendering of its exploration model for the Cabin Lake Gold Project. This news release contains statements that constitute "forward-looking statements." Such forward-looking statements involve known and unknown risks, uncertainties and other factors that may cause Rover's actual results, performance or achievements, or developments in the industry to differ materially from the anticipated results, performance or achievements expressed or implied by such forward-looking statements. Forward looking statements are statements that are not historical facts and are generally, but not always, identified by the words "expects," "plans," "anticipates," "believes," "intends," "estimates," "projects," "potential" and similar expressions, or that events or conditions "will," "would," "may," "could" or "should" occur. There can be no assurance that such statements will prove to be accurate. Actual results and future events could differ materially from those anticipated in such statements, and readers are cautioned not to place undue reliance on these forward-looking statements. Any factor could cause actual results to differ materially from Rover's expectations. Rover undertakes no obligation to update these forward-looking statements in the event that management's beliefs, estimates or opinions, or other factors, should change.